What happens during a cervical smear test..it’s not that bad! As I have yet to reach the age of 25, I hadn’t had any experience of a smear test. Yes as a sufferer of endometriosis I have had many gynaecological interventions- but not an actual smear, this was alien to me. Through my previous placement at a GP surgery I saw cervical smear tests daily and to my surprise, they really weren’t a bad or negative experience. I have spoken to and know a lot of women who are terrified of attending for a cervical smear ‘it’ll be embarrassing’ ‘what if I see the nurse in town..she’ll of seen my bits! !’ ‘it’ll be painful’ ‘I’m young I don’t need to worry about cancer’..the list of excuses goes on and on. When in truth it is estimated at least 2,000 cases of cervical cancer are prevented each year in the UK because of cervical screening. Around the age of 25 you will get a letter telling you it is time for you to have a cervical screening appointment with your practice nurse. From then on you will be invited every 3-5 years depending on local policy. It is important to book the appointment when you are not on your period as this makes it harder to get a clear sample of cells. 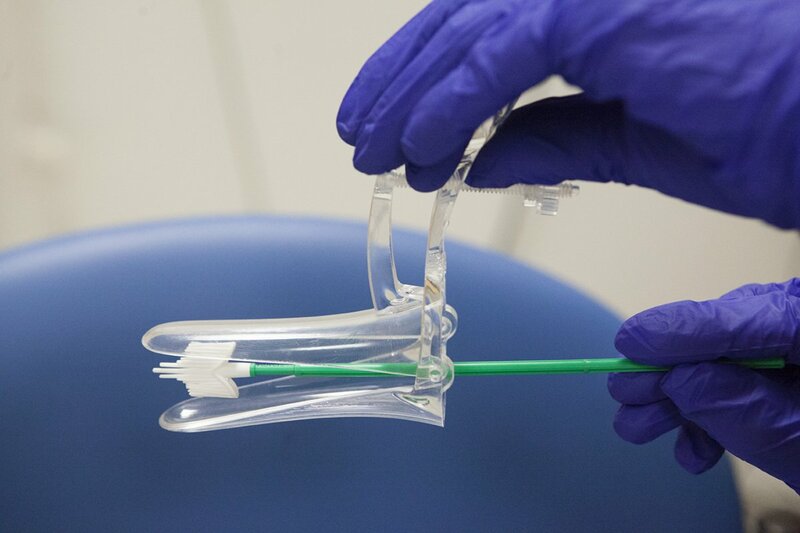 Once the speculum is inserted, the nurse will gently open it so they can see your cervix. This women has described to be as slight pressure..almost like you need to wee! The nurse will then use a small instrument, like a soft brush to take a sample of cells from the cervix’s ‘OS’ the only way I can describe this is like a donut..the OS is the ring in the middle! (sometimes Nurses call this a ‘scrape’-although that should not be how it feels!). See picture below of speculum and brush. I hope this blog will help you realise that cervical smears are not a scary or painful experience..they are most definitely worth booking and attending. It could save your life! 3 years ago I was diagnosed with Endometriosis. For as long as I can remember, I have dreaded my period- not in the ‘oh I was gonna wear white to this party’ kind of way or even in ‘ugh this inconvenient’ kind of way. In the way that my entire being filled with dread when I counted the weeks since my last. I knew that once again, I would cancel plans, I would be in debilitating pain and would of course be accused of ‘skiving’ from whatever regular commitment I had. Painkillers and a hot water bottle were my best friends but this was no real relief, instead hoping the ‘placebo’ effect would kick in and I’d trick myself into thinking I was feeling better. See https://www.youtube.com/watch?v=NWUXI62GtfM&feature=youtu.be for a really helpful video on understanding endometriosis. On average it takes women 7 years to get diagnosed and there is still NO known cure. It took me over 7 years to get diagnosed, with my beautiful sister struggling on for 9 years before a diagnosis (it is not known if endometriosis runs in the family, for us unfortunately it has). Menstrual health is not something that is taught in schools and no education is available for young women, therefore when I began to have extreme pain, passing large clots and felt generally awful 24/7 I had no idea what the cause was. I was told by medical professionals that ‘everyone has period pain’ and that it was ‘all in my head’ unfortunately something that women with endometriosis are told all too often. It wasn’t until my sister had a laparoscopic investigation where they found endometriosis that I pushed for my doctor to refer me to the gynaecology department considering we had very similar symptoms. Upon seeing the gynaecologist he was extremely dismissive, unwilling to refer me for the laparoscopy (the only way to get a diagnosis) and I practically had to beg for this- again being told that what I was experiencing was normal, and that I was just being ‘over dramatic’. After my laparoscopy it was found I did indeed have endometriosis. It was such a relief to have a name to something that had been haunting me for the last 7 years, however after the diagnosis there was very little follow up or help in how to manage this condition. I could have another laparoscopy to have the endometriosis either burned away or scrapped out (depending on the trust different procedures are done) however this is no guarantee the endo will not return or that you wont be left with debilitating scar tissue damage. Another option is early menopause- Not something at 19 I really wanted to consider. Or different contraception such as the pill, the implant, the coil etc…however most of these do nothing to alter the symptoms of endometriosis and so stronger pain killers are the only slight relief women suffering from this condition have. This is not good enough. I have been told at 23 years old I should start trying for a family sooner rather than later due to the condition and the chance I may need fertility treatment. I have been also told by a college lecturer that I simply wont get pregnant- she knew nothing about my personal case let alone about the condition. I am forever being accused of skiving from whatever commitment I have and that it cannot be ‘that bad’. Being a student nurse is exhausting for anyone, having endometriosis on top of this is a struggle. While most prefer to work longer shifts- having 3 days on 4 days off, this for me is not worth while. Being on my feet for 12+ hours at a time causes my body to cramp and I am in debilitating pain, this is something I am accustomed to and can get through until the end of the shift. However the 4 days ‘off’ are not ones I can enjoy, I can be bed bound from the pain, unable to move without wanting to throw up or pass out and usually unable to leave the house. I have previously forced myself to attend placement during a flare (need the hours!) and during handover I passed out from the endo symptoms- this was on my first day. I awoke on the floor, to staff surrounding me, taking my blood pressure and checking my blood glucose levels. I then had to explain my condition to the ward sister and was sent home, this set me back further and I had another week of placement because I did not feel safe to practice. No good helping a patient to transfer and passing out on them! Currently my condition is manageable although I am always in some level of pain. I have to prioritise my time being a student- if I am in considerable pain and it is a lecture that I am able to view the presentation online and understand it, then it is not worth me attending university to then be in more pain the next day- causing a domino effect. This is something I wish my fellow students, lecturers and placements would understand. I am fed up of people calling me ‘stranger’ because I haven’t been in uni for a week, being told ‘oh I get period pain too- have you tried paracetamol’ or being asked not to lean when writing my notes on placement because it looks ‘unprofessional’ when I am struggling to stand. More education is needed on endometriosis- it is still not widely known. Often I am on placement and the healthcare team do not know what it is. This is not acceptable, 1 in 10 women suffer from this condition and yet people ignore it because its ‘icky’ and ‘no one wants to talk about periods’. Menstruation is natural, every woman goes through menstruation and yet when it isn’t normal it is almost a taboo subject..why? Please, please, please research endometriosis, arm yourselves with the knowledge and share with everyone. This needs to be addressed. If anyone is suffering from the symptoms- diagnosed or not then I am more than happy to talk to you about it! Supporting each other is key! As most of you know if you’ve been following me on twitter, I am extremely passionate about practice nursing, so much so that I have taken a post for when I qualify in July. This however is not what I had planned..
At the start of my adult nursing degree I was dead set that I wanted to work somewhere as challenging and gory as possible- In short A&E or theatres, however as the three years have progressed I have fallen more and more out of love with acute care nursing, so much so that I considered leaving the course in second year. Each placement I was faced with mentors who did not have ‘time for students’ and was often left to my own devices, working as a healthcare assistant more than a student nurse. As much as I loved this opportunity to get to know my patients and spend as much time with them as possible, I felt that my actual clinical skills were not as developed as I had hoped or imagined to be. So you can imagine my delight when I found out my first placement of third year was in a General Practice- 8 weeks of regular hours, no shift work, no nights and no weekends. Pure bliss! Before even starting my placement I was contacted by the practice, asking if I had any off-duty requests and then with a detailed timetable of where I would be working for the entire 8 weeks, this was a stark contrast from ringing the wards and getting ‘Cassie who..?’ as well as often finding out my shifts only a week in advance. This gave me the opportunity to actually plan out the next two months of my life and have a proper ‘work-life’ balance, something that I had missed over the last 2 years of my nursing degree. My first day I was greeted at reception, given a tour of the entire practice and got to spend time with each area of the practice including reception, care navigation and dispensary so that I got an entire feel of the practice and how it worked on my first day. Throughout my placement I was encouraged to spend time with the entire MDT team, including the GP partners, the paramedic, nurse practitioner, assistant practitioner, HCA’s and of course the practice nurses. No two days with the practice nurses were the same. We would go from seeing new borns for their immunisations to leg ulcers then to cervical smears. I was amazed by the variety of skills that the practice nurses had, their clinical skills surpassed those that I had seen in acute care. They worked much more autonomously, making clinical decisions regarding things such as wound management, chronic disease management and much more in-between. Although the chronic disease management decisions had to go through the doctors, this was often in partnership with the nurse and their clinical opinion. I began to fall in love, the variety of patients that I would see on a day to day basis meant that I was literally caring for people ‘from the cradle to the grave’, I was able to promote health in a positive way, having time to speak to patients about their lifestyles and the small improvements that could be done. Finally all of the theory and clinical placements were clicking in to place. I had to use all of my clinical, communication and management skills each day, meaning that I was able to develop these further. Putting me in good stead for my final placement. While I was on placement they had a position open for a Practice Nurse due to recent retirements. While I would have loved this position, I understood that they needed to employ somebody asap and so I didn’t even consider applying. However as my placement went on I was asked ‘where do you want to work when you qualify’ and people seemed shocked when I told them this placement had swayed me, I wanted to work in general practice. They then asked me if I would consider the position if the nurse practitioner put me forward, I was shocked and thrilled! I could not believe I would even be considered, let alone offered the position..this would not have happened without the entire practice support, rather than the usual ‘you can’t go straight into practice nursing, you need at least a years ward experience’ they understood and agreed..why go and work in a hospital when you have no plans to actually work there? Something the nurse practitioner knew too well, having gone straight in to Practice Nursing from qualifying, she was my biggest support and put me forward for the role, doing all the background work with the amazing assistant practitioner to ensure a plan was put in place until I qualify. A&E walk-ins such as burns, minor injuries and everything in-between! Continuity of patient care- seeing people from the start of life to the end. This list is not exhaustive and each day a practice nurse is faced with something different. I have plans to continue developing my training and aim to eventually become a nurse practitioner. Practice Nursing is my calling, that is something I am sure of. Despite the outdated view that it has ‘no career development’ or ‘somewhere nice to retire to’ I know that my future in nursing is bright, there is so much to learn, so many skills to develop and I cannot wait to get started. why would I ever want to work any where else??? If any one has any further questions about Practice Nursing or would like to know more then don’t hesitate to get in touch! Lets start at the beginning..
Little bit nervous about starting a blog as it is something sooo out of my comfort zone, but feel it is important to share my journey, thoughts and feelings. As well as being inspired by my fellow student nurse Danielle- you can read her blog posts here —> journeytomakeadifference.wordpress.com without her support, I wouldn’t have gotten through this course. As far back as I can remember I have always wanted to become part of healthcare, being inspired from the care my loved ones have received as well as thinking ‘this needs to change’ and wanting to be that change. From then on I have pursued the nursing path…albeit not always smoothly! I am so very close to the end now, having just finished my penultimate placement of third year and now thinking about dissertation (please send help!) I felt that I finally can use my voice and write a blog about my experiences and my love of nursing. I have just accepted a post as a newly qualified Practice Nurse from when I finish university in July and I am sooooooo excited! I have also just become an Ambassador for the GPN Student Nurse Network (you can follow them on twitter @Gpnsnn) and so I will be sharing my journey and love of Practice Nursing. I hope you enjoy reading about my journey and sharing your own with me! I’m hoping to soon write a post about my experience as a student in practice nursing and why I have chosen to work there, watch this space…!